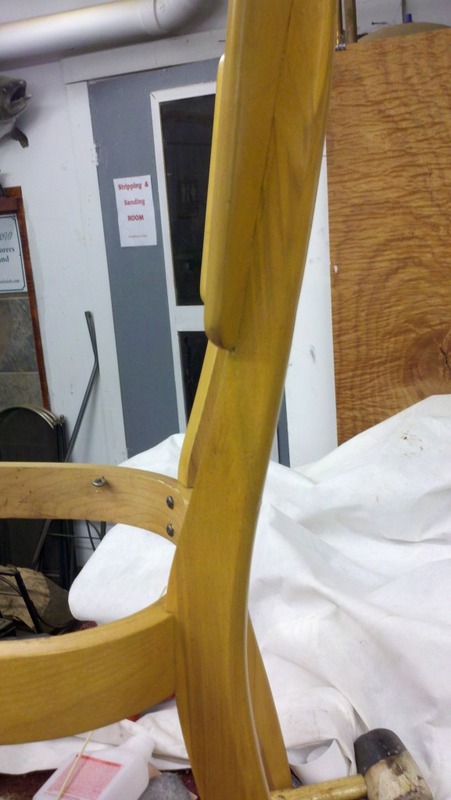 This repair tutorial is on a Heywood Wakefield mid century modern chair, but the method is universal and will apply to any style or design..
At The Restoration Studio, we specialize in Heywood Wakefield refinishing. 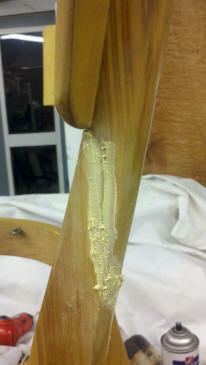 This job was to refinish 4 champagne chairs to wheat, and repair one the had a broken back. 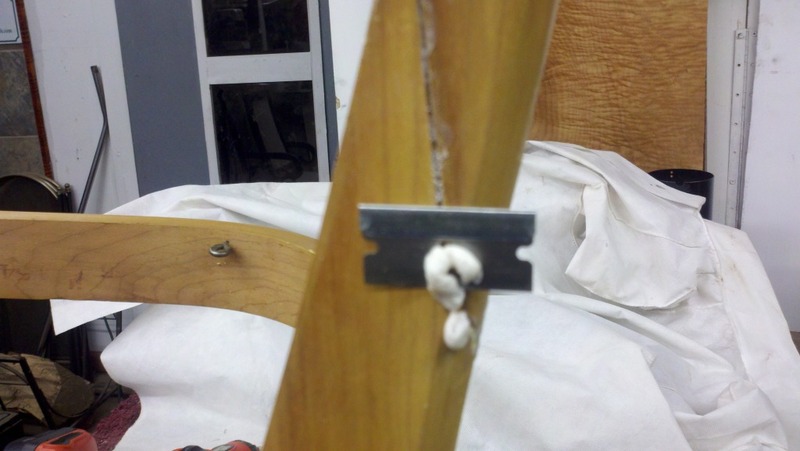 Let me take you through the steps of how to repair a broken chair the correct way. We won't be using and screws or nails, so you can set them aside ! Below: This type of break is super common. It's a fairly clean break that the owner had tried to fix using epoxy. 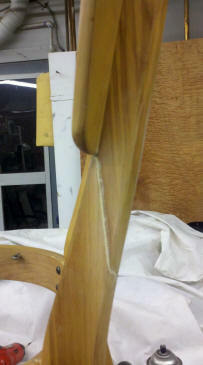 The epoxy didn't hold, so our first task is to remove the old glue the best we can. I used a block to separate the joint and give me room to work. 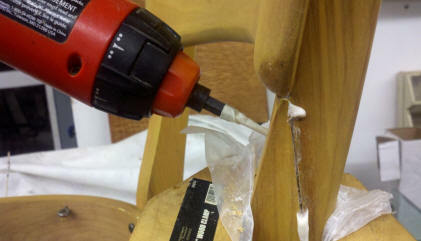 I then use a chisel and scrape off the old glue. I decided the best glue for this repair would be Gorilla glue. The fit back together wasn't great, and I noticed some gaps. Gorilla glue excels when the fit is less than perfect because it also acts as a great gap filler. 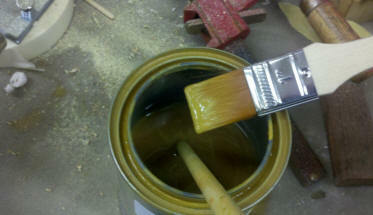 Below: I squeeze glue onto some used sandpaper and load an artist brush with the glue. Below: With the block still in place separating the joint, spread a thin coat of Gorilla glue over both sides, being sure not to use too much glue.....just a thin coat. 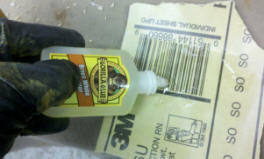 Gorilla glue expands, so you don't need a lot of it. 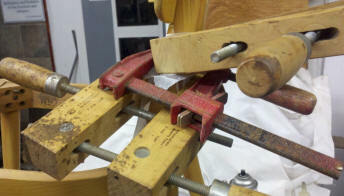 Once the glue is applied, remove the block and clamp tight. I used wax paper between the clamps and the wood. Below: Within 5 minutes, see how the gorilla glue was expanding and pushing out of the crack. 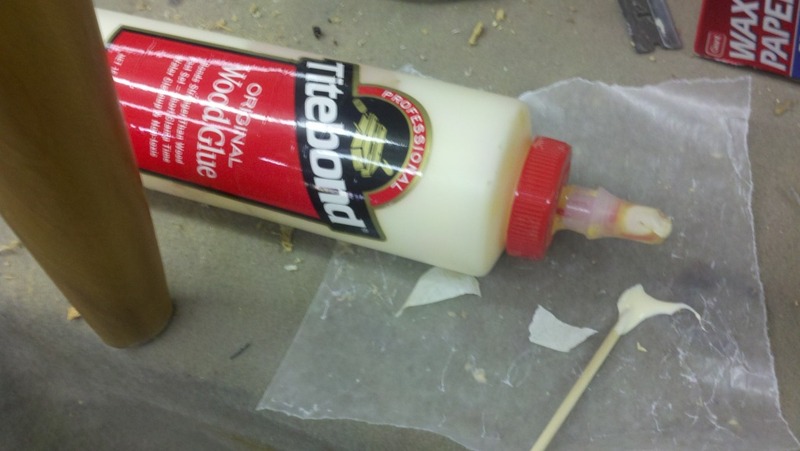 Below: Once the glue is dry, I removed two of the three clamps. Now, this is where many people stop, but we want this repair to be permanent so we will take it another step. I am going to insert two dowel pins. Size can very depending on the job. Be sure your drill bit and dowel are the same size. 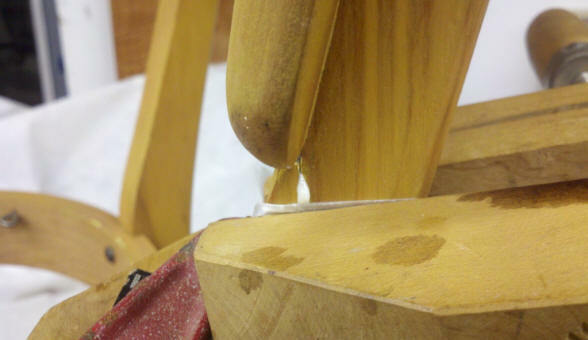 Place the drill bit up against the chair rail (pictured below), and mark the bit with a piece of tape at the depth you want to drill the hole. This will keep you from accidentally going to far and drilling through the back. it will push the dowel out of the hole. 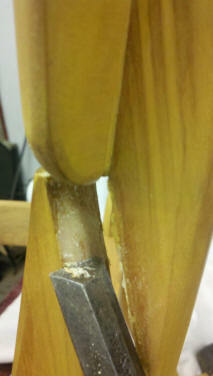 Cut two dowels longer than you need them to be, and coat them with wood glue. 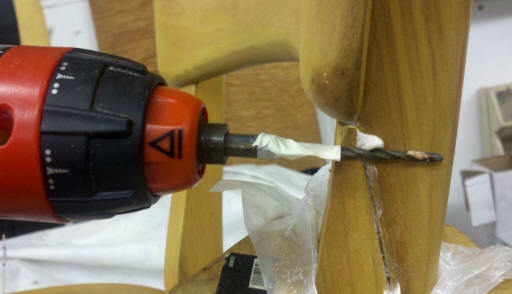 Below: Now, drill two holes for the dowels, using your tape as a stop. I choose to drill them at opposite angles. 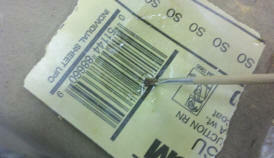 Below: Place your dowel in the hole, and gently tap the end with a hammer until you hear it bottom out in the hole. 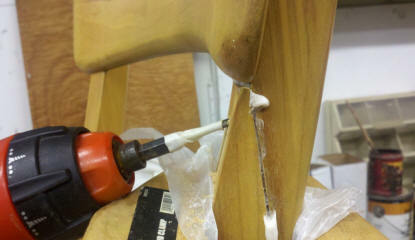 Don't use too much glue...the dowel should fit snugly in the hole, so a little glue is all that's needed. 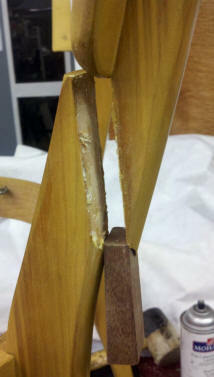 Next, we can cut or snap off the excess dowel and trim off the excess glue (Below). 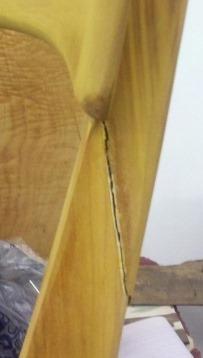 The "repair" aspect of this job is now finished and we can be sure it wont come apart again. 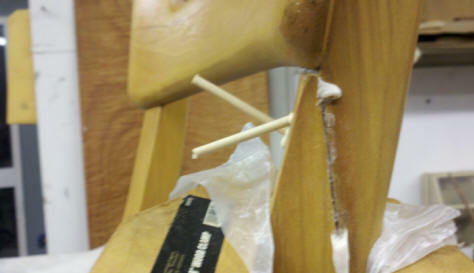 Even if the glue failed, our angled dowels will keep the back in place. 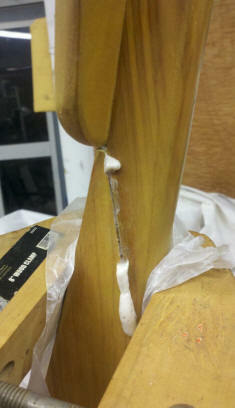 They also take a lot of stress off the glue joint, decreasing the risk of it ever failing. There are a few ways to go about the touch up on your chair. Absolute perfection need not really the goal here....we simply want to blend the crack away so that you won't notice it upon a glancing inspection. 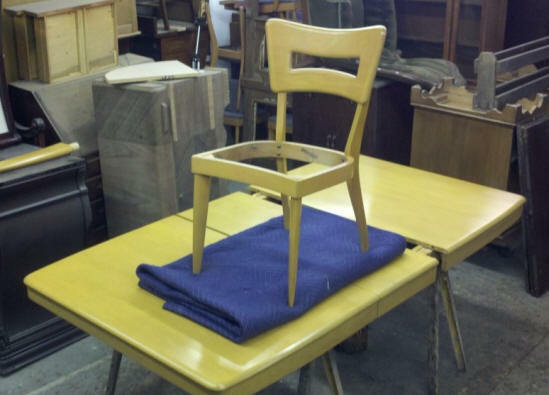 You could keep it simple and use a colored wax stick, you can fill with wood filler and use Fix & Finish touch up paint, or you can use our refinishing stain (if you are refinishing the chair). 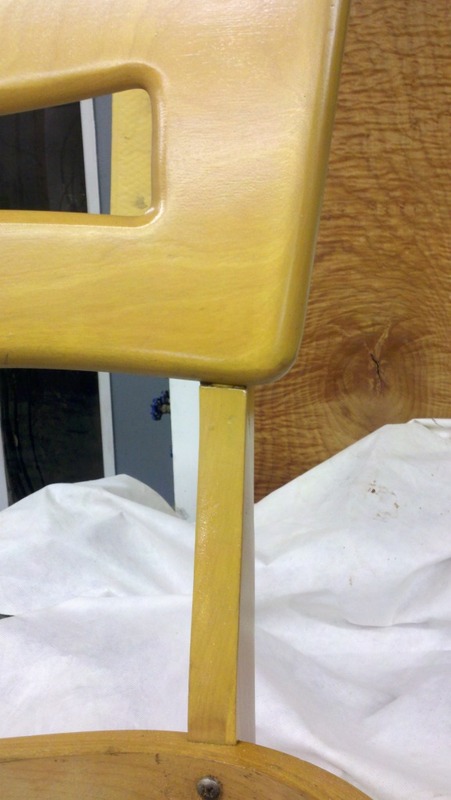 Since this chair is being refinished, I will opt for the third choice, and use the refinishing stain. 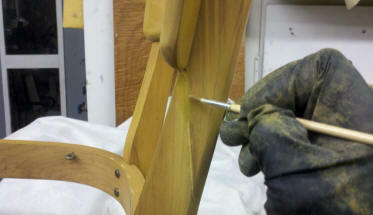 Below: I use standard wood filler and fill the crack. Once it dries, sand smooth and it's ready for touch up. Below left: I want the "sludge" in the bottom of the can. The colorant settles at the bottom, so be sure not to stir it first. 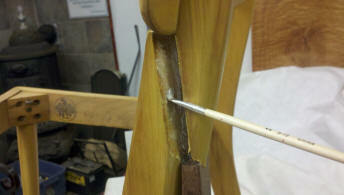 Below Right: Using an artist brush loaded with stain colorant, I paint in the crack. A hair dryer on low heat helps speed up the drying. 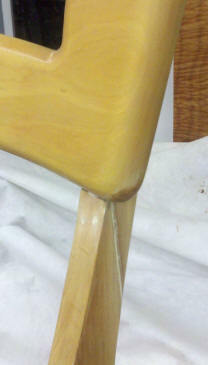 Below: After touch up, we finish the chair. I primed this area a couple times with our toned varnish, allowing each coat to dry before I went ahead and finished the entire chair. All Refinished in Wheat and ready to go home to it's owner.